Ever since at least the time of "Goodbye, Columbus" with Dustin Hoffman and Anne Bancroft, we have been fouling our own home like this. It does not seem very sensible. Capt. Charles Moore is author of the book Plastic Ocean published October 27, 2011. Please share what he has to say. The video is from TED.com. "Capt. Charles Moore of the Algalita Marine Research Foundation first discovered the Great Pacific Garbage Patch -- an endless floating waste of plastic trash. 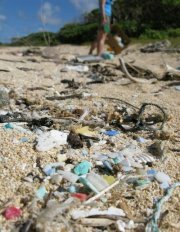 Now he's drawing attention to the growing, choking problem of plastic debris in our seas."